This how Airwiz will inspect, diagnose, and repair your dryer vent problems to make sure your dryer vent is safe and up to code. These are some of the codes and guidelines that we have simplified to make it easier for homeowners to understand. 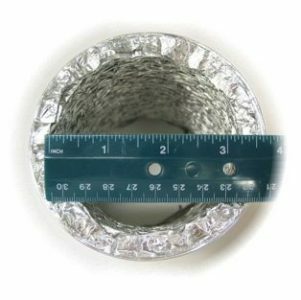 We use IRC and IMC codes as well manufacturers best practices to inspect dryer vents. A clothes dryer will vent about a gallon of water for each load of laundry. 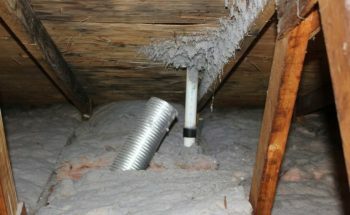 If the dryer vent is disconnected and in a crawlspace, attic, or other building cavity, the potential for moisture-related damage is significant. We find a lot of rotten roof sheeting because the dryer was venting inside the attic. Mold problems are common as well when a dryer is leaking air or venting inside the house. 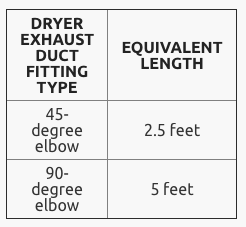 According to the requirements of the 2009 International Residential Code (IRC) M1502, the clothes dryer exhaust duct should be made of metal, with No. 28-gauge thickness, a smooth interior finish, and a duct diameter of 4 inches. The maximum length of the exhaust duct does not include the transition duct. If the exhaust duct is concealed within the building’s construction. A transition is the visible piece of duct connecting the dryer to the wall duct. It is allowed to be up to 8 feet long and should never go through the wall. Transition ducts must be visible and not concealed within construction. Not only is a poorly exhausting dryer less efficient, it can also be a fire hazard due to the flammability of the accumulated lint and the lack of fire resistance. 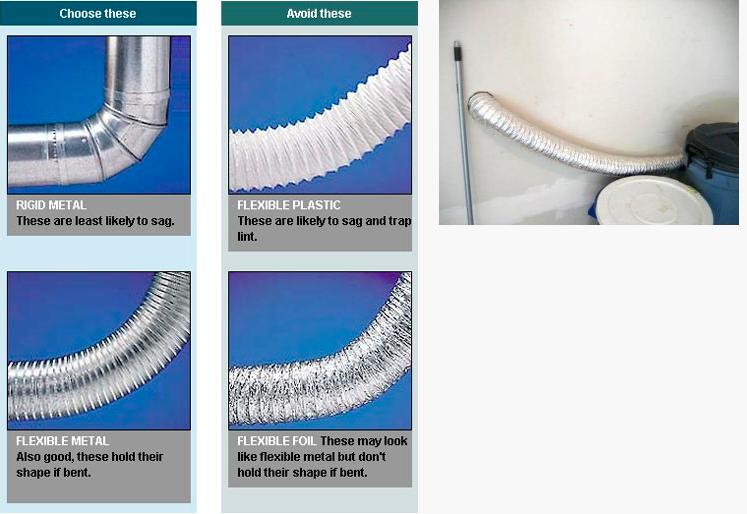 The use of foil or PVC pipe for dryer exhaust ducts is also not allowed by modern building standards. Another best practice is to restrict the dryer exhaust duct from passing through an attached garage. Ducts in the garage or penetrating the walls or ceilings separating the dwelling from the garage must be constructed of minimum No. 26-gauge sheet steel or other approved material, having no openings into the garage. 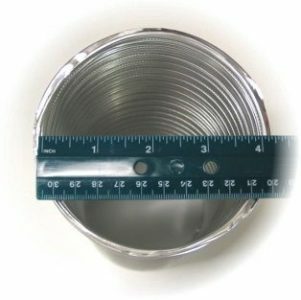 The duct should be secured in place and supported at intervals not to exceed 12 feet. One best practice recommends supports installed at 4-foot intervals. Sags in the duct must be avoided. We find disconnected ducts inside the walls all the time, it’s a big repair that includes opening the walls, duct repair, drywall repair and painting. It could have been prevented if the ducts were properly supported. The termination outside the building should be located at least 3 feet from any other building opening, and at least 10 feet from an air conditioner or heat pump condenser. The duct termination should be fitted with a closeable damper (a backdraft damper). 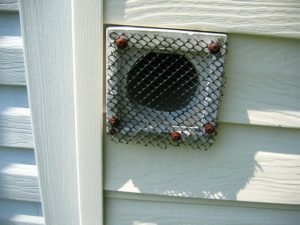 A mesh may not be installed at the duct terminus (2009 IRC M1502.3), as it can trap debris, which poses a fire hazard. 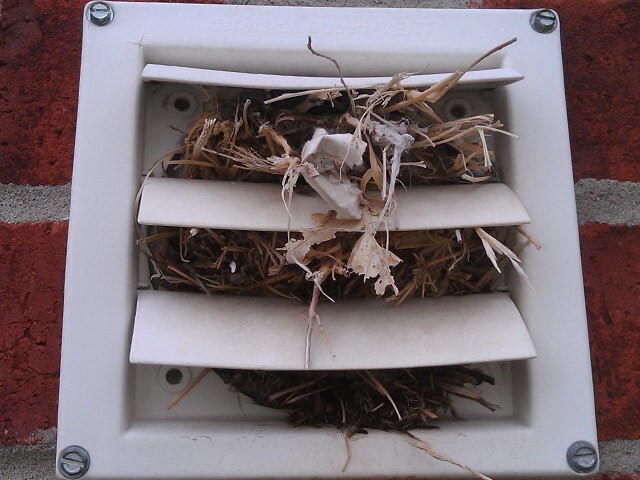 • Check the termination for birds’ nests, debris and damage. • Clean the lint filter before or after each load of laundry. • Remove any visible lint within the dryer. • At least once a year, have a professional technician clean the dryer exhaust pipe. • Gas dryers should be cleaned and serviced regularly by a professional. • Install a smoke alarm in the laundry area. • Install a CO alarm in the laundry area for a gas dryer. Call or email Airwiz to have your dryer inspected or cleaned if you prefer a professional to do it for you. HVAC System Quality Checklist, Local Mechanical Exhaust. 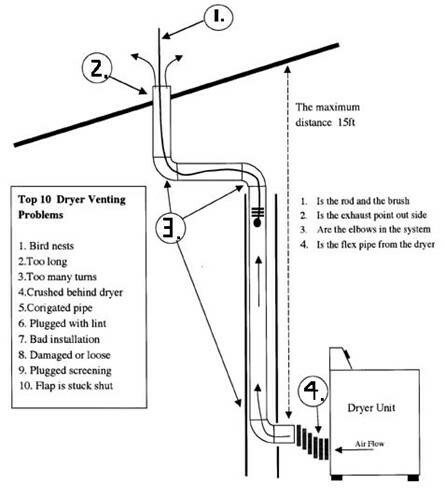 Clothes dryers vented directly to outdoors, except for ventless dryers equipped with a condensate drain. This topic is not specifically addressed in the 2009 IECC. Section M1502.2 Independent exhaust system. 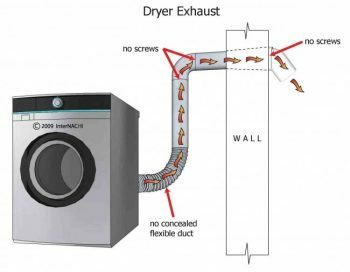 Dryer exhaust systems to be independent of all other systems and convey the moisture to the outdoors, unless listed and labeled condensing (ductless) dryers are used. This topic is not specifically addressed in the 2012 IECC. Looking for a free estimate? Call us to set up an appointment at (301) 871-2250. Why does a chimney need cleaning and inspection? 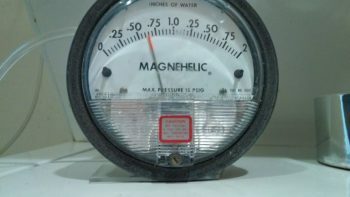 How do I know when it is time to clean my dryer? And how often do I need my dryer vent cleaned?